The state capture commission of inquiry has adjourned until 09:30 on Friday. The commission adjourns until Friday 09:30. "Gavin Watson knew about absolutely everything," claims Agrizzi. He says Watson would dictate to him which attorneys to use. These, he claims, where people who are "loyal" to the Watsons. He says all these decisions were made by Gavin Watson, or an "appropriate executive". Agrizzi, however, agrees participated "knowingly" in many actions of bribery, "though I was not the mastermind". "So, there was no possibility that I could bribe someone," says Agrizzi, adding that he was not allowed to meet anybody alone. He says as COO, he was not allowed to make decisions alone. He was required to consult with all divisional heads before making any decision. This included the hiring of employees. Agrizzi also says that he didn't have access to Bosasa's bank accounts. Agrizzi says he was asked to give Joe Gumede "30 loves of bread". So, in essence, "loaves of bread" was synonym for bribery money. At some point, Agrizzi says that they would used code-phrase "loaves of bread" to refer to bribe money. Asked about "codes" they used when transacting money illegally, Agrizzi jokingly says he was taught bribery "by best skelems". 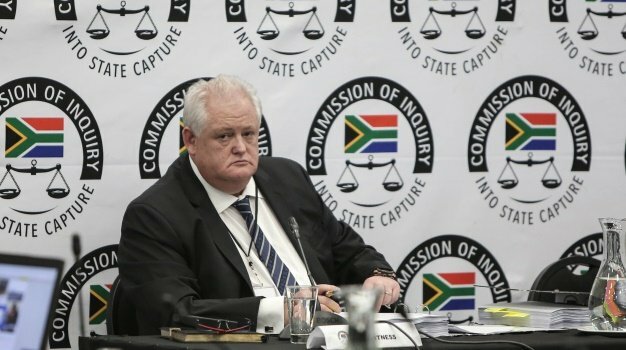 Bosasa got a better BEE rating through corruption, Agrizzi tells the commission. Agrizzi is detailing the Bosasa staff who he recorded as collecting cash on a monthly basis, and to whom the cash would be paid. PP: When you were last here, you were asked to decode the names captured in your little black book. AA: Bosasa paid Gillingham's divorce settlement (R2.2-million). "Hell hath no fury than a woman scorned," Agrizzi says. "I was told to make sure we took care of Gillingham's wife." Agrizzi refuses to share who did the digging, says he is already in trouble. "I will not," he says. SARS would be very interested in the testimony Agrizzi is being led through now. He is speaking to Bosasa's failed prawn project in PE, SeaArk. Massive tax dodging and fraud. They dug up holes at SeaArk and buried computers there, Agrizzi testified. Agrizzi says he met with Gillingham at a restaurant where he told him what had taken place. He says Gillingham confirmed he had been suspended. Arrangements were made to assist him with his suspension. Says Gillingham was worried about his pension. Gillingham was promised by Bosasa's Gavin Watson that he would be paid his pension, and his monthly earnings when he left DCS. R110 000 a month, for about four years. Agrizzi's testimony over interactions with former DCS chief financial officer Patrick Gillingham is a damning account of how Bosasa bought, paid for and kept Gillingham. He was Bosasa's man. And they made billions thanks to him. Back from Lunch. Agrizzi deals with his involvement with former correctional services boss Patrick Gillingham. He says his interaction with Gillingham was strictly on instruction from both Gavin Watson and Danny Mansell. Agrizzi says he is aware of a R12m donation made to the ANC top 6. Zondo questions why senior officials within govt who have read about Bosasa corruption decided to look away and not say: "I want to know whether these things I am reading are true." Zondo says for years things have been reported about Bosasa corruption and nothing has been done. Agrizzi: I think what you said it is so true. That is the power that the Watsons have. Agrizzi: I'm sitting here today vulnerable. I was told so many times that they are the most politically connected people in South Africa. Agrizzi: They would always threaten me with politicians. He says he was told about how close Valance Watsons' children were to some of former president Jacob Zuma’s children. The Watson family, whose links to Environmental Affairs Minister Nomvula Mokonyane were exposed during explosive testimony at the Zondo commission on state capture, want to build a controversial wind farm in the Eastern Cape. And the minister on whose decision their plans depend is … Mokonyane, GroundUp reported. Mokonyane has a history of a direct relationship with the eldest of the four brothers, Gavin Watson, and also, at the very least, a tangential relationship with the “wind farm branch” of the family: two of the younger brothers, Ronald (Ronnie) and Valence, and Valence’s son Jared. Lunch backs: Chicken, juice, energy bar, fruit. These were needed to be prepared delivered on short notice, says Agrizzi. Agrizzi: On the first occasion she was premier, the second occasion I can't remember if she was premier or MEC. #StateCaptureInquiry Agrizzi is asked about how many deliveries took place and the costs of the works conducted with Minister Nomvula Mokonyane and the activities he was personally involved in. AA: On one occasion cash was delivered to Mokonyane while she was Premier of Gauteng. She was in the position between May 2009 to May 2014.